New Economy Project recently sat down with Pablo DeFilippi and Rene Vargas Martinez from Inclusiv to learn about their work supporting financial cooperatives (or “cooperativas”) in Puerto Rico. While mainstream banks have been widely criticized for abandoning the Island or profiting off disaster, the cooperativas have been central to Puerto Rico’s resilience and recovery. The conversation underscored the power of Community Development Financial Institutions — or CDFIs — as we continue to fight, alongside our partners on the NYS Community Equity Agenda, for New York to support these institutions locally by allocating funding to the NYS CDFI Fund. Tell us a little bit about the financial landscape in Puerto Rico before Hurricane Maria. The banking industry in Puerto Rico, much like on the mainland, has always catered to wealthier consumers and businesses, rather than low-income people and communities. The financial cooperative system in Puerto Rico goes back at least 50 years and emerged for the same reasons as credit unions on the mainland, including lack of access to financial services. Large numbers of Puerto Ricans have long been disenfranchised from the financial system. The cooperative financial system in Puerto Rico is very strong. One in three Puerto Ricans — more than one million people — are members of these cooperativas. That network of 125 cooperativas has been part of the DNA of Puerto Rican communities, rural communities especially, for generations. So you have this incredible system of community-owned CDFIs embedded in communities across the Island. What role did they play after the Hurricane Maria hit? After Hurricane Maria, CDFIs in Puerto Rico were back on their feet in 48 hours serving their members–while the banks were much more hesitant to restart operations, particularly in the countryside. These institutions became lifelines for many communities. 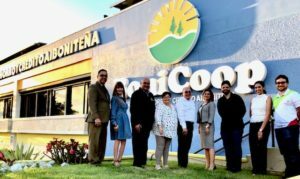 In a recent visit to the island, we visited Coop Moca, a financial cooperative on the Northwest side of the island. Its CEO, Yerelin Barreto, told us about how her house was damaged but she left her family to go to the cooperativa because she knew she needed to be there for the members. I used to run a credit union in NYC, the Lower East Side People’s Federal Credit Union. After 9/11 it was exactly the same thing. The whole city shut down, and guess what? We were up and running 24 hours later. You feel a sense of responsibility, of obligation. This woman was telling us exactly that. That’s the power of a community-owned CDFIs. The incentive is not the money. Of course, they have to be viable and sustainable, but they’re owned by the community and they’re accountable to the community. Seventeen out of 78 municipalities in Puerto Rico were served exclusively by cooperativas, months after the storm. These were the only places you could get cash, and often the only places to get food, water, or electricity. They served as community centers. At the Sagrada Familia cooperativa, there was a kitchen where people cooked and distributed food to the town. How has Inclusiv been working with the cooperativas since Hurricane Maria? We have been using the tools we have as a network of CDFI credit unions across the US, to open up access to resources for sister institutions on the island. We held our first CDFI convening in Puerto Rico in February 2018, just four months after Maria. We helped several of the cooperativas get certified as CDFIs and apply for funding from the federal CDFI Fund. In spite of the entire Puerto Rican credit union system clearly being eligible for certification, that connection had never been made. This led to four of the Puerto Rican cooperativas getting technical assistance funds, totalling about half a million dollars. That was a turning point. The cooperativas realized the CDFI Fund was real. I want to emphasize that because there’s an issue of trust. People on the island feel neglected and taken advantage of. This year we held our second convening and had a full house. We’re hoping that in this next round of funding, more credit unions will get awards. Then more cooperativas will be encouraged to apply, and to connect with CDFIs in the mainland. It opens up a lot of different opportunities. New York and Puerto Rico obviously have a special relationship. What would you say to people in New York who want to support or learn from this work? There’s a two-way street here. On one hand, we can learn from the cooperativas. There’s a lot of expertise being developed in terms of how CDFIs can respond to these emergencies and build communities that are more resilient and more inclusive. At the same time the cooperativas can learn from things we’ve done in NYC. There are energy efficiency programs, for example, that could be replicated in Puerto Rico. We’ve got to build those bridges. Many CDFIs operate in communities that are vulnerable to climate change. We have to prepare for that future, and CDFIs have an important role to play. Let’s apply that lens to New York State, a place with deep inequality and vulnerability to climate disasters like Superstorm Sandy. How can policymakers here support the growth of these kinds of institutions? We need to create a supportive infrastructure for community-owned solutions. Clearly low-income communities need to control their money. You’re right about the scale of inequality and we can’t change that with the traditional banking system. CDFIs and specifically financial cooperatives can be a solution. They’re owned by the community, they’re accountable to their members, they’re transparent. To the extent we can create legislation and resources that enable these institutions to thrive that’s going to go a long way.